Originally featured in the Omaha World-Herald on January 11, 2014. When proposed as Omaha Public Library’s sixth permanent branch location, Swanson Library, 9101 West Dodge Road, was considered a solution to the increased migration of families to west Omaha. However, Swanson Library almost didn’t happen. Prior to the donation of the land at 90th Street and West Dodge Road by the Swanson family, plans were already underway for a new library at 78th and Pacific Streets. Within a year of the Swanson family’s donation, the plans for the Pacific Street library were abandoned. 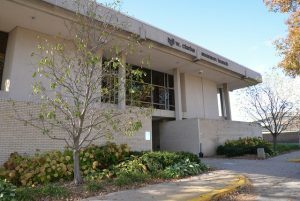 Before it would be built, Swanson Library still had to overcome challenges associated with zoning, traffic and financing. Tremendous support from the educational community and area residents propelled the project forward. The library opened to the public in February 1966. Leo A. Daly designed Swanson Library to serve a growing suburban area that was expected to triple in size by 1980. The site was oddly shaped and therefore called for a long, narrow structure. The building was created to provide an open, inviting feeling by incorporating floor-to-ceiling windows and few walls. The space also included an auditorium and conference room. Upon its completion, it immediately became the busiest library in the system, breaking a single-day lending record in its first week of business. Today, Swanson Library continues to thrive and is treasured for its rare children’s collection and regular book sales by the Friends of Omaha Public Library.